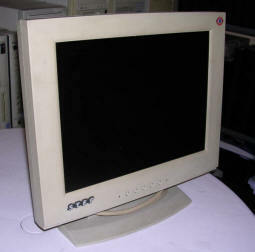 In my collection, different PC displays accumulated over time with computers, PCs, sometimes as part sources which have been surprisingly repaired. From simple TV-like displays with green screens, to complex monitors with digital control circuits. Here is a small travel around these. Don't forget to look at some PCs, as they also have monitors to complete a set. The first LCD monitors could be seen in notebook computers in 1990s, but their poor response time, bad contrast and limited colour depth made them insufficient for graphics or even advanced office applications. 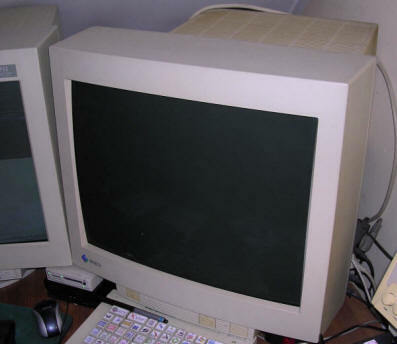 In 1980s and 90s monitor contained a large vacuum tube which shown, with few tens of Watts expense, usually acceptable picture. 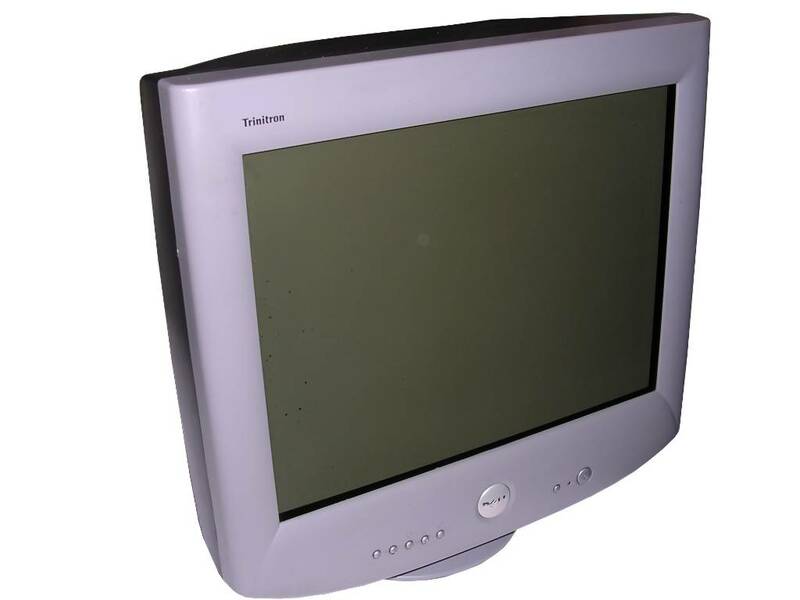 Of course CRTs became more and more energy-efficient - starting from switching converters, which could turn the display off when not used to higher efficiency of electron beam and deflection circuits. However, the later displays were made the worse the quality was. 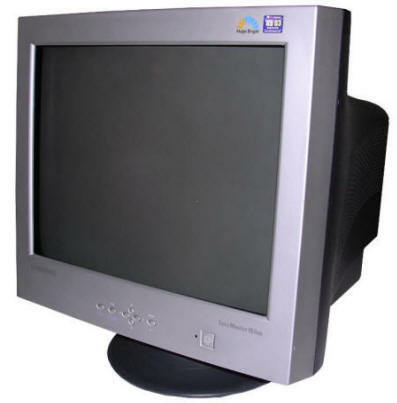 Finally, expensive LCD monitors became more affordable and offered better quality - more because CRT became worse than LCD better. 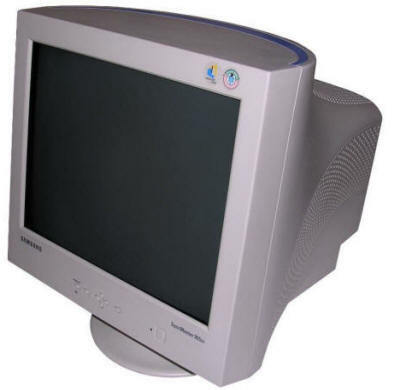 Although the first usable LCD displays became available around 1997, their price was comparable to 4-8 CRT displays and quality of picture, especially dark images, was much worse. Many of them required dedicated video board too. 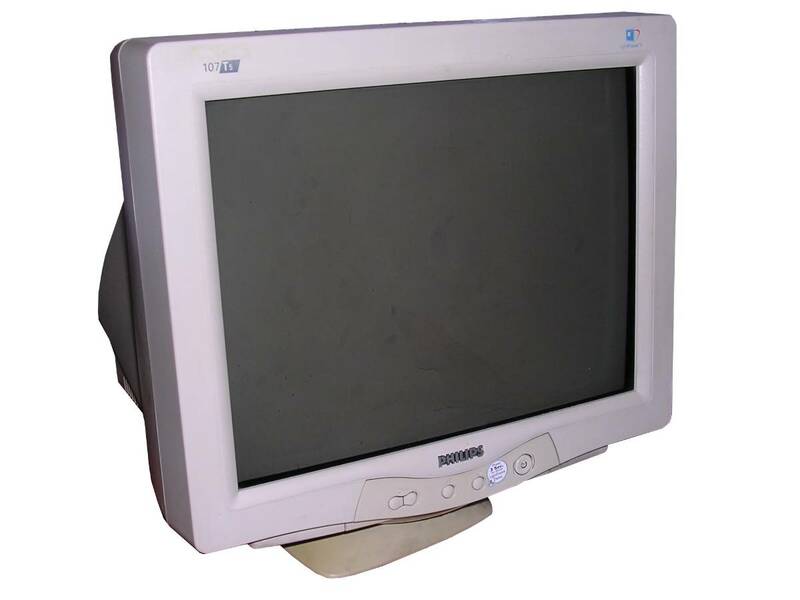 The last CRT displays, Samsung, LG or Eizo, were made around 2005. There were good and bad displays in this era. Why LCD screens replaced tubes? There are a few reasons. First, they were smaller and more energy-efficient. 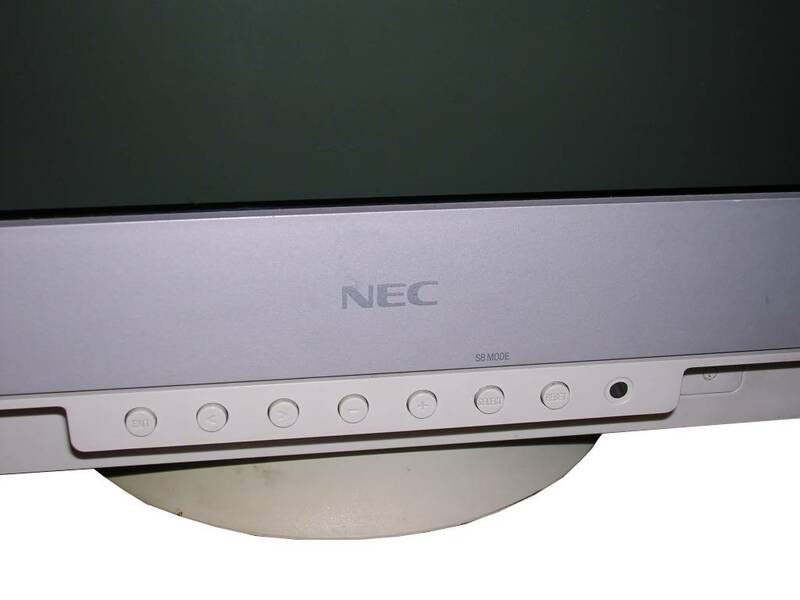 Taking the power consumption, the typical LCD took about 50W while CRTs could use two times more, and "panels" occupied less space. Second thing was the fashion. Presence of flat screens in lots of movies and visions of the future made the panels chosen despite of their worse image quality. The third, and probably the most important thing was the upgrade path. Upgrading your CRT display and video board is independent - you can use many resolutions with one CRT, switch between them if e.g. game doesn't run well, and quality loss is small. In LCD, monitor is bound to resolution, so upgrading video board makes user more likely to buy a new display, and buying a display makes users more likely to buy new video boards. This made display manufacturers push LCDs to the market by all costs. 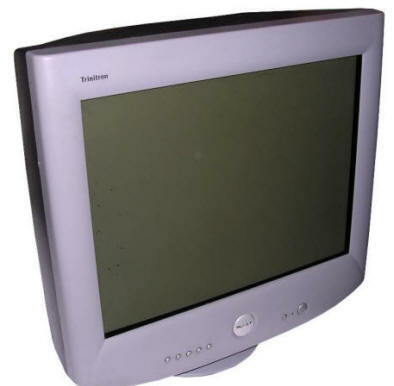 Here we can see the last of CRTs, from times when LCDs were already present on the market. 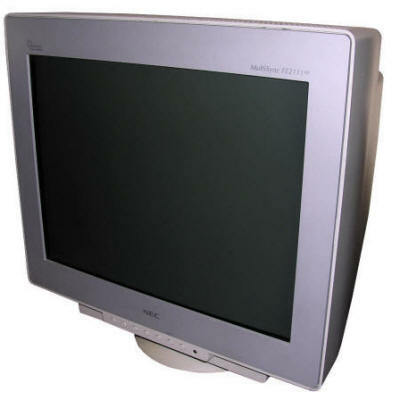 An LCD from 1999, poor quality, but it was flat. 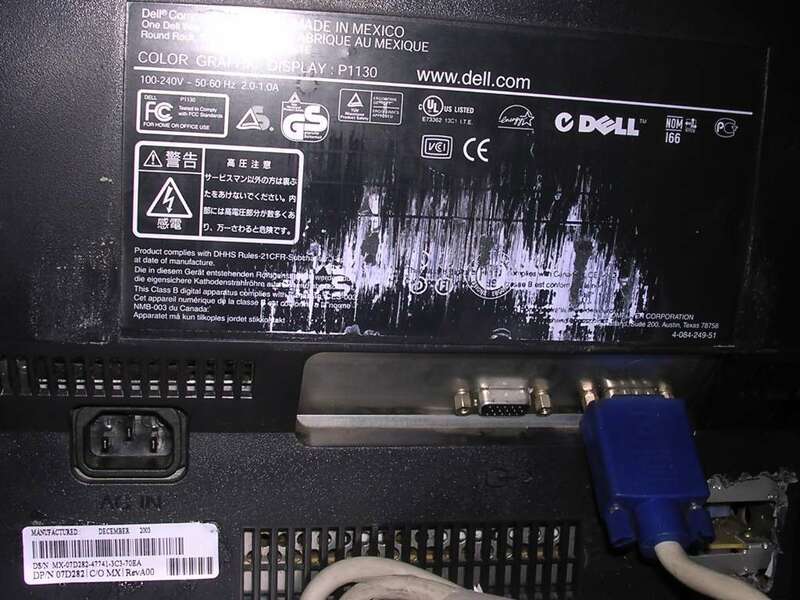 Generally, what I found about quality: Eizo>Nec>Philips>Iiyama>Sony>Dell>Other. However, every manufacturer has better or worse models. More, if you plan to get Eizo, better reserve much space on the rear of desk because this monitor doesn't get narrow on the rear (more, its rear lifts up). 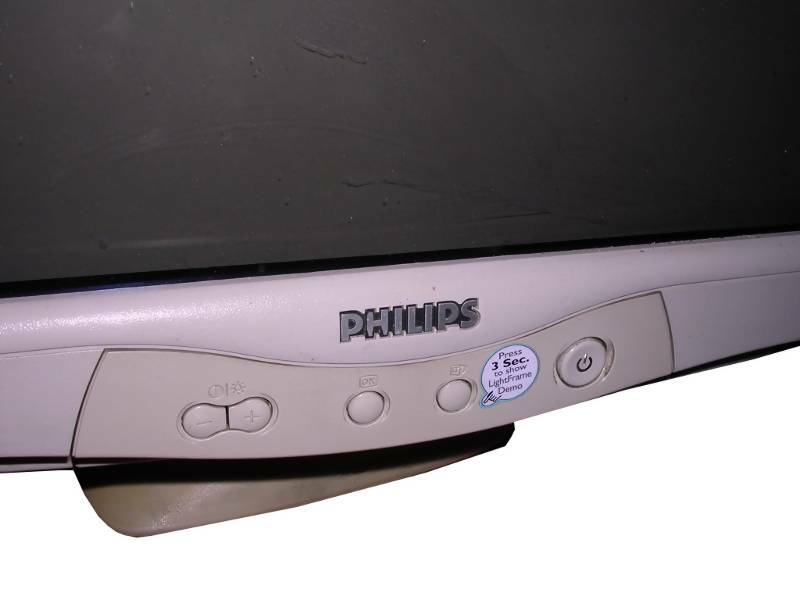 Around 2000 Philips refreshed their "SoHo" (Small office/Home office) series of lower-end displays. They had smaller capabilities than Brilliance series, being made for operation in home or office systems. 107E was the "base" model with the most basic functions like OSD, and not much more. 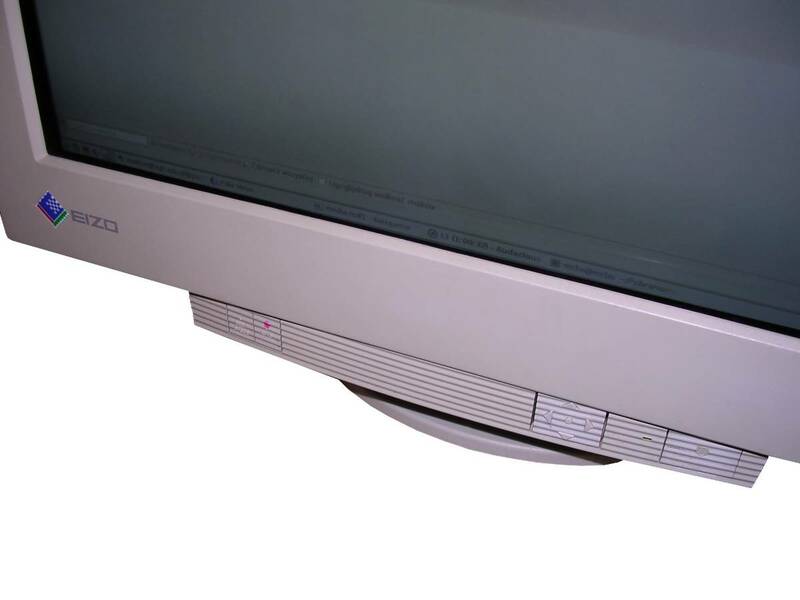 The CRT's surface is not flat, which was a new technology in early 2000s. However, it is Philips, so it still gives an acceptable picture with good colours. Manual is still available in Philips site. 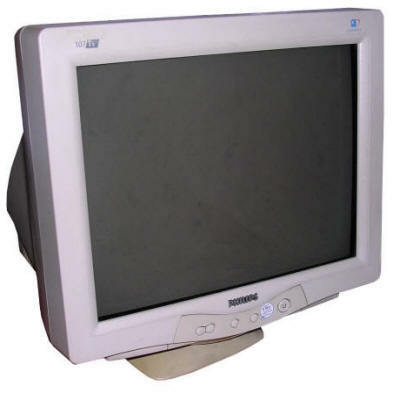 With monitors like this one, a whole CRT era ended, with bulky tubes being replaced by smaller flat LCD monitors (however, still displaying smaller amount of colors and incapable to show black). This is one of the more advanced monitors, it has a few interesting features not commonly found in other displays. First, its screen surface is totally flat. Not round, not barrel-like, but flat, which was a new thing in 2000s. Next, its power switch operates in soft mode. Additionally it has more advanced OSD and a LightFrame mode which increases brightness of the picture, but not a whole picture. It was a software-hardware solution, in which by using some software it was possible to increase parameters only on specific areas, e.g. with video or picture viewed. The result, unfortunately working only in Windows 9x, 2000 and XP, is interesting and indeed works surprisingly well. Unfortunately it doesn't work for Linux even where there is a Linux program for it available - analyzing sources it still draws bitmap for monitor's controller like Brilliance 105's configuration. The display has been purchased from surplus in quite nice condition and it is still used. 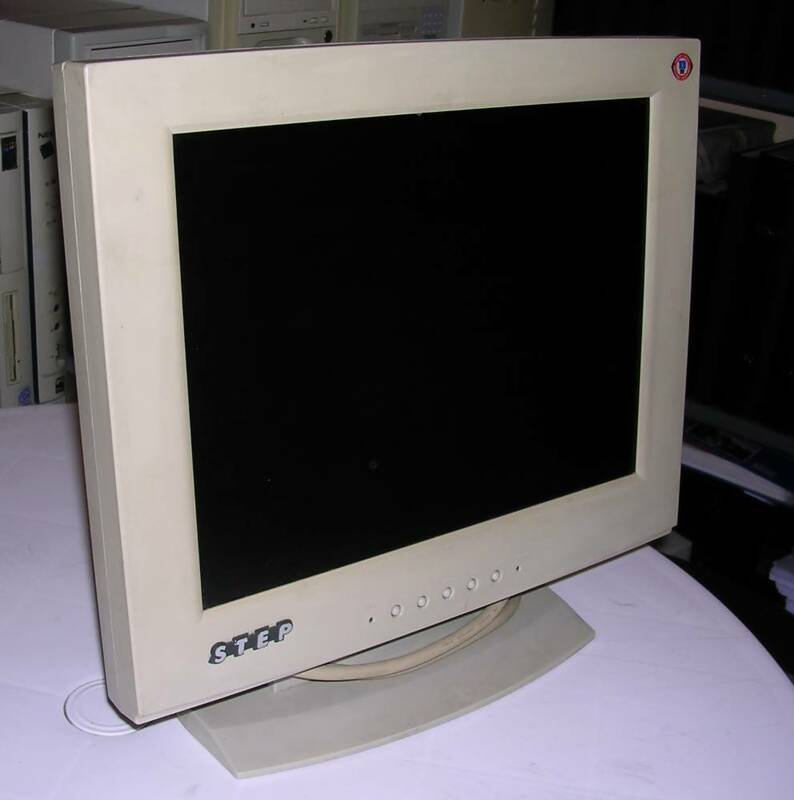 Contrary to 21-inch displays these units were not forced to work on maximum parameters of components, so they can outlive many LCDs with poor capacitors. Manual is still available in Philips website. A semi-professional large-screen display with nice contrast, brightness and sharp picture. It has only one input, and, unfortunately, quite large margin around CRT so having two of them won't make a good dual-screen experience. Its OSD has quite large intelligence with auto-adjustments, a few presets and advanced settings. I still use it with Macs. 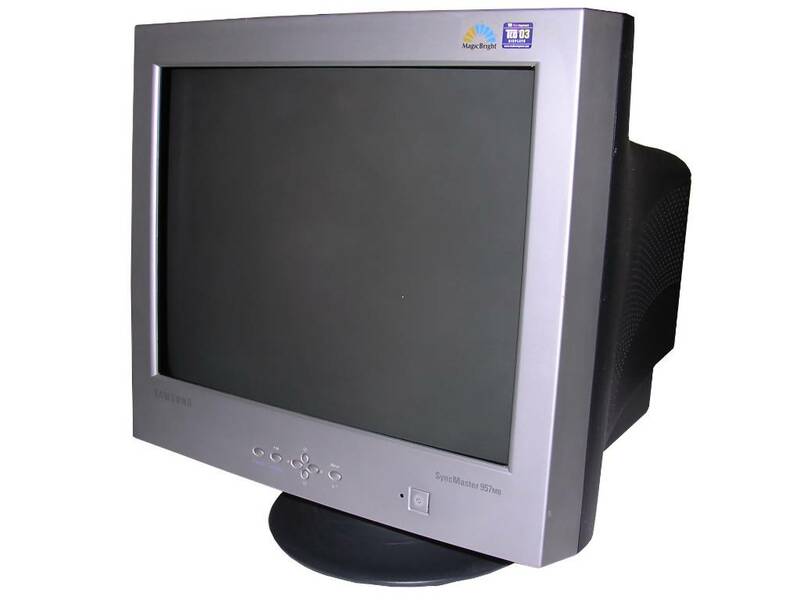 One of the first professional monitors which became available in "second-hand" market simultaneously with its factory distribution - new items were sold in some places until 2003, although the construction is from late 1990s. Its screen is not flat, but its picture is nice and sharp when maintained properly. 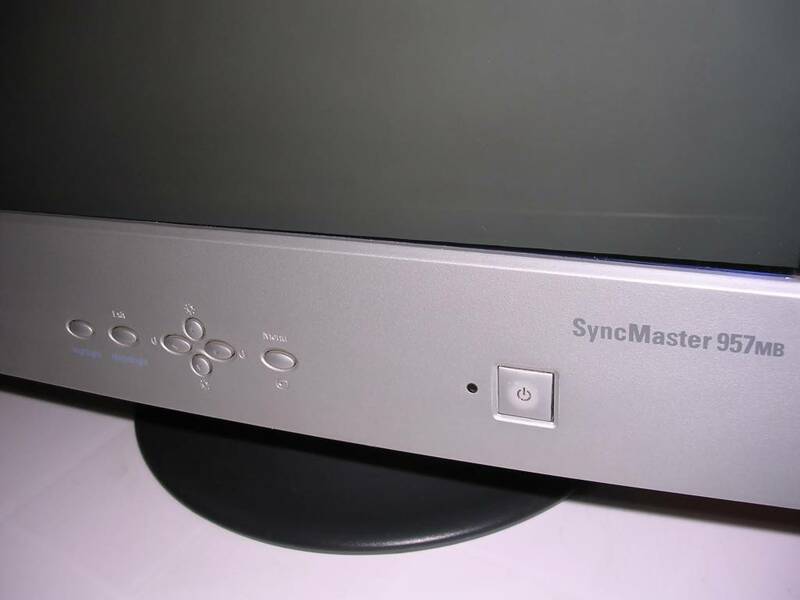 It has BNC inputs, typical for high-end display units but also a Sun-compatible input. The downside is that it needs active cooling so it has a fan. 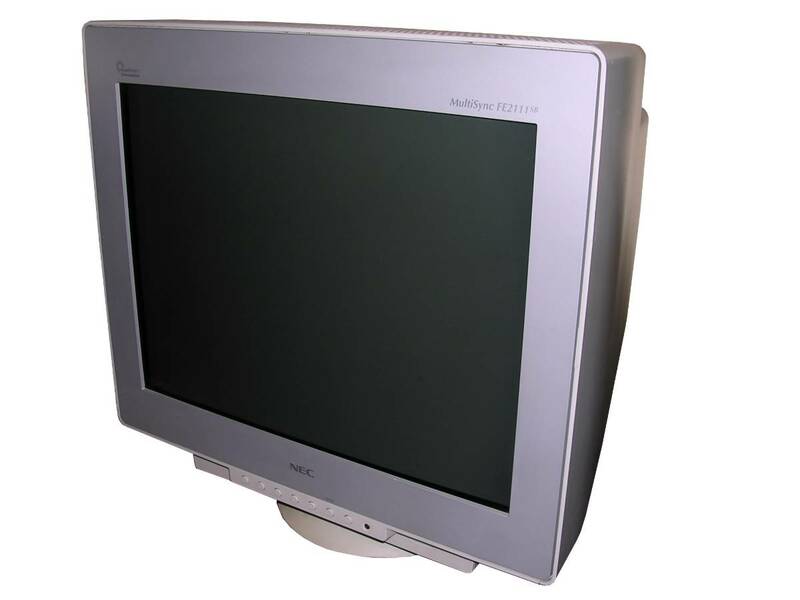 Although the T-line is known as the last Eizo's CRTs, this one is also quite late. It has a flat 21-inch screen and, as all Eizos, configurable OSD menu with modes and tuning options. Comparing to older F56, these were more "maxed out" and had more problems coming with age. I still use Eizos with my desktop PC. They are large and power-consuming, but the picture quality is very good and dark colours are dark colours. 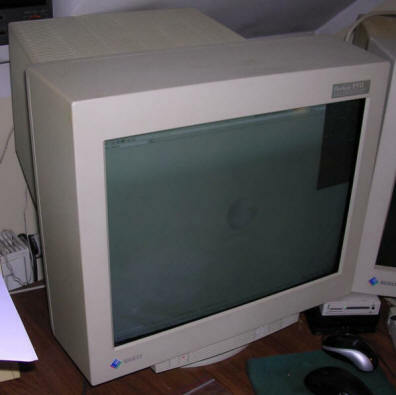 One of the last CRTs, with Sony Trinitron picture tube. These tubes offered a very good quality, but required complex circuits. 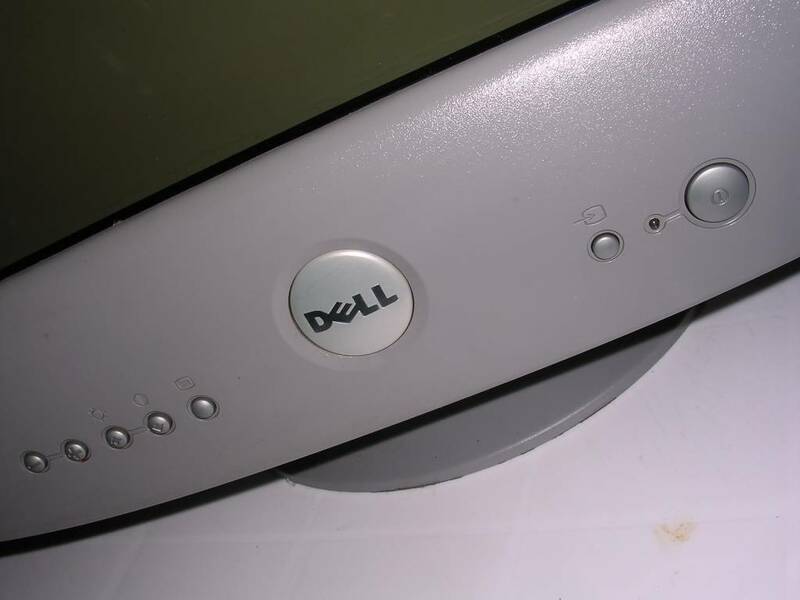 This is a Sony unit, branded as Dell. However, there are some disadvantages. First, the border around screen is large so having dual-screen is a problem. 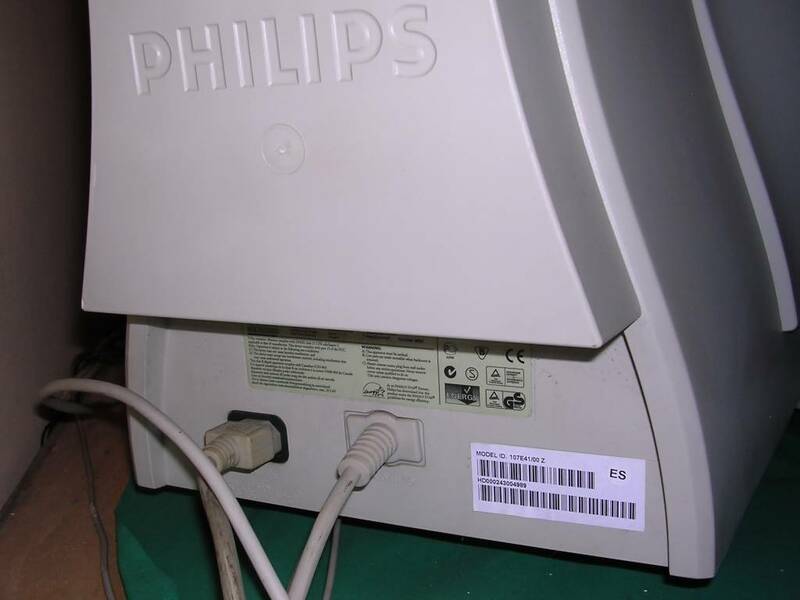 Another problem is the CRT, which becomes brighter and brighter with age, so it needs a re-adjustment. Fortunately the tuning can be done with a hardware hack. 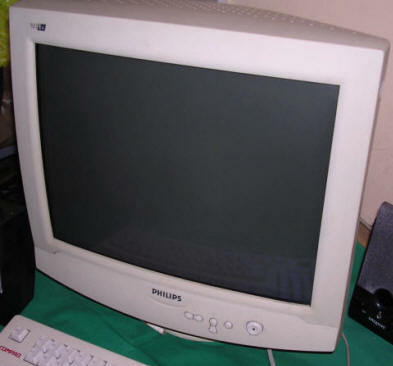 Another problem is the screen size, Trinitrons had a bit smaller viewable area than other tubes. 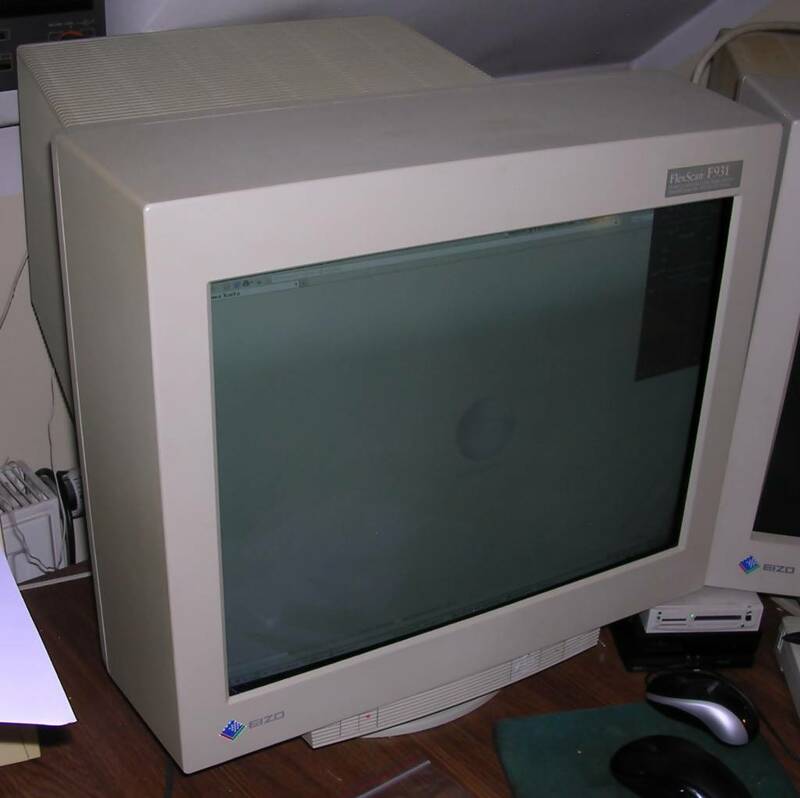 A 19-inch CRT with flat screen surface. 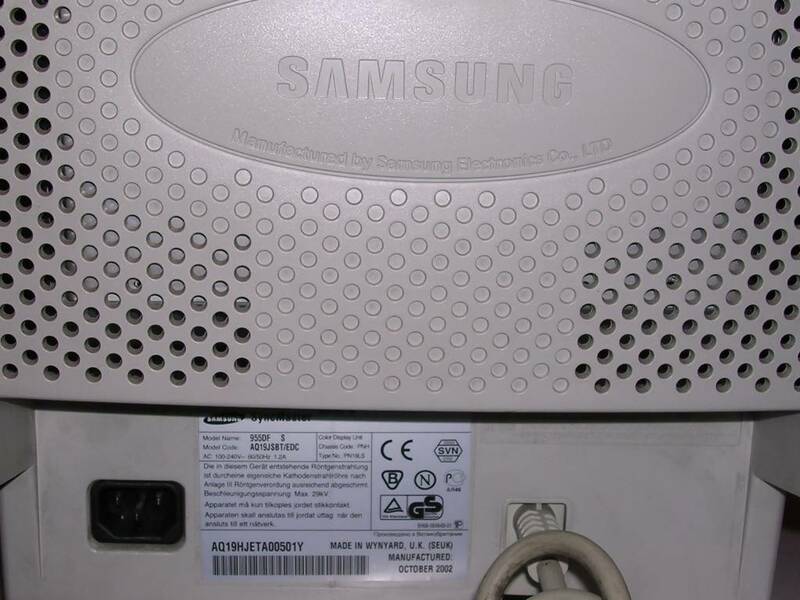 This is a "budget" Samsung from the "better quality" line containing, among others, for example 957 model I also have. The OSD is simple, but sufficient. Only some pre-defined settings cannot be easily explained. The picture is acceptable, however tuning the focus is a bit hard, there are no holes for it. And convergence... anyone tried? Although this model seems to have support for some kind of region brightness boost, like Philips units had, I haven't made it running. Contrary to 957MB, this one has no USB or other maintenance ports. I got two Samsung displays on a "take_it_away_from_me" conditions and it looks like they are OK. Keeping in case Eizo fails :). 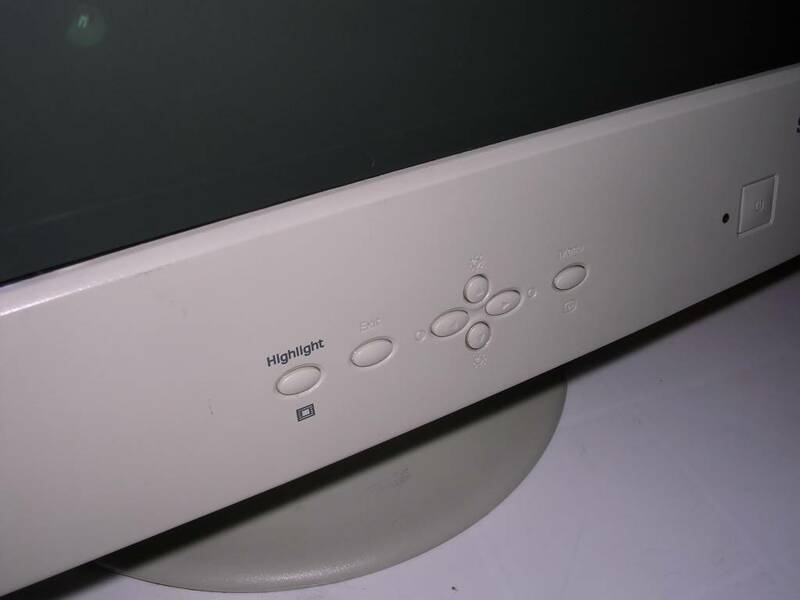 A better model from the flat-screen line, later it became a standard one. 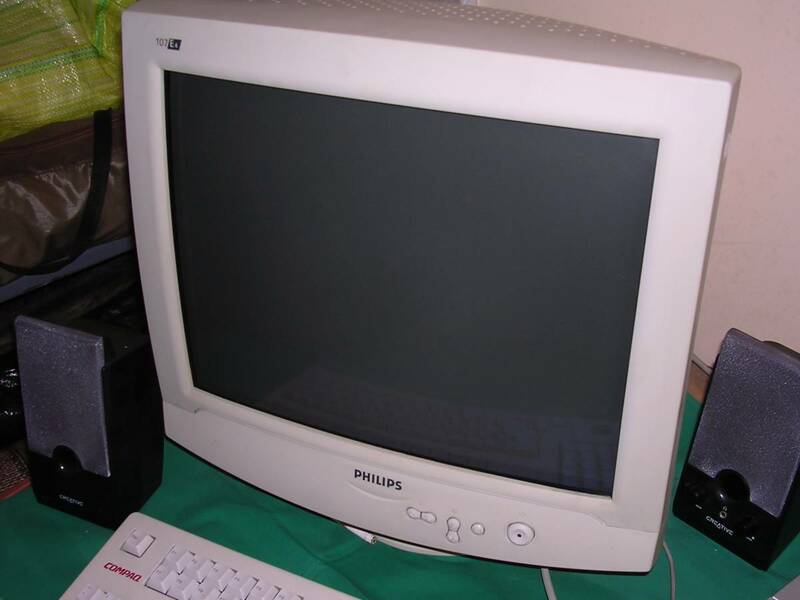 It has a flat-screen CRT, with relatively nice picture quality. 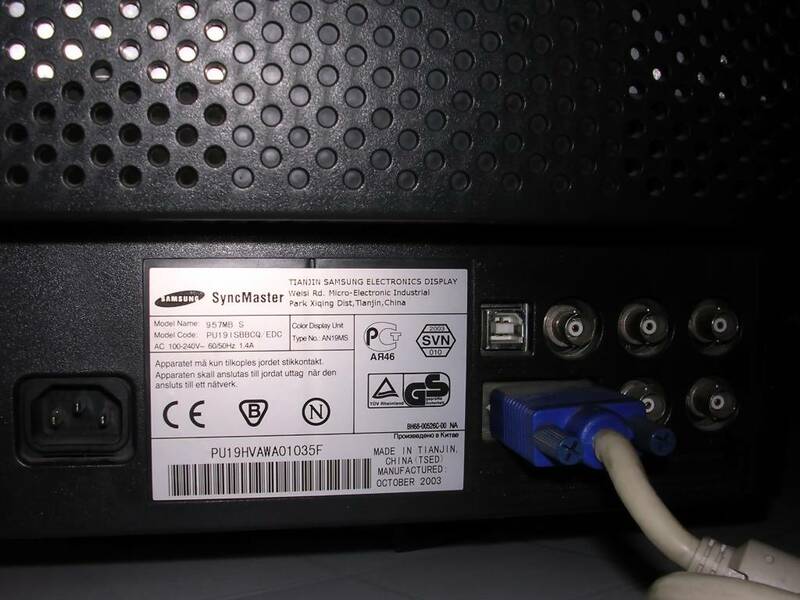 This one has two inputs, VGA and BNC. It also has a USB port, but not for USB switch, common in displays from 2000s - in this model it is used to tune the display by software. Although there is even a Linux software for it, I haven't managed to get it working. 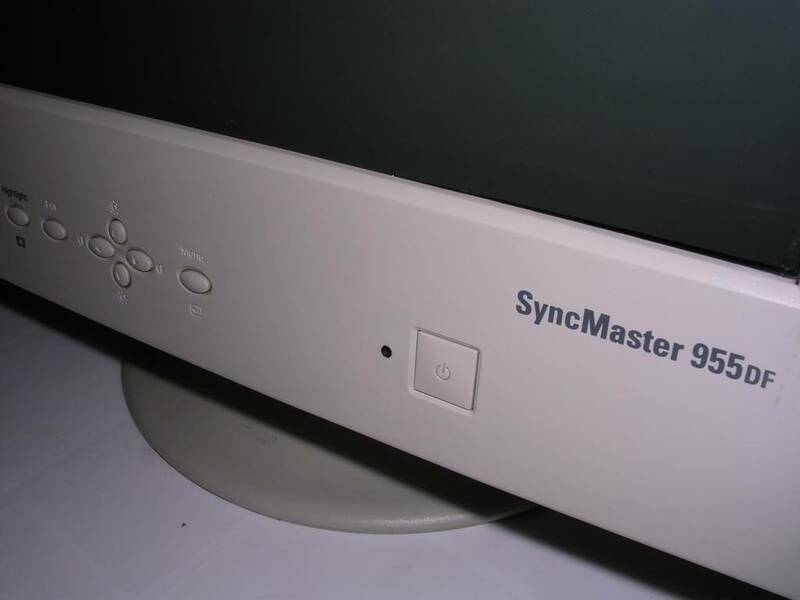 There was a similar 957MB, but without BNC, detachable VGA cable and USB tuning support. 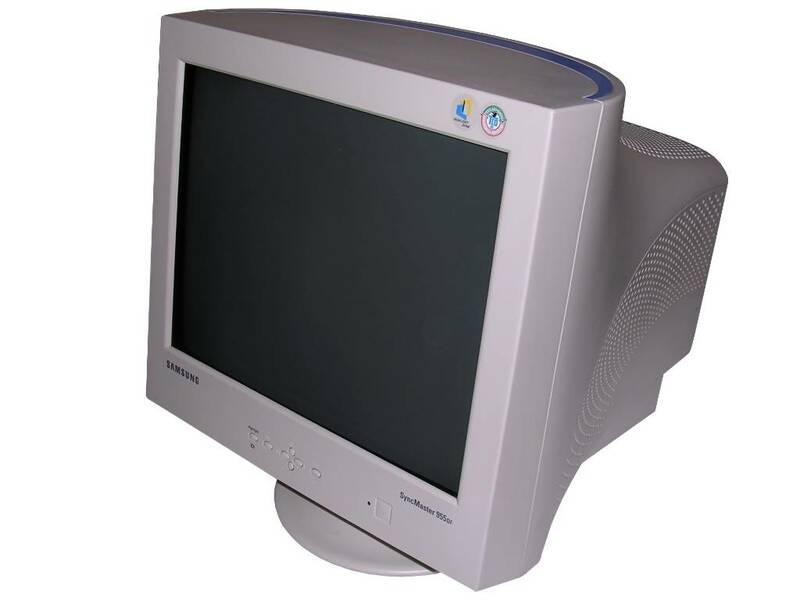 However, the last Samsung CRT monitors were the models with buttons on the right side of CRT, they were relatively good.